New Patek Philippe 2012, the Rose Gold Ref 5207R.Patek Philippe is not just quality watches in "height"
Patek Philippe is not just quality watches in “height”, but also in “width” – meaning the number of collections, number of clocks that make up the number of variants and that the House continues to offer each year in addition to the firsts. 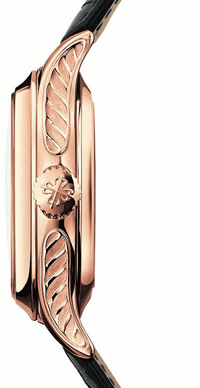 Among the changes / variations at Baselworld 2012 in Grand Complications collection this year brought the incredible craftsmanship Reference 5207R-001 – for the first time declined with rose gold case, as well as indices, hands and anywhere you see a metal to be applied. It’s a watch out of town at 360 °, with the exception of Patek Philippe, which introduced him for the first time at Baselworld 2008 exhibition “dress platinum”. To get to the point, the 5207 – in a chest-style Calatrava – includes a minute repeater, a tourbillon and a perpetual calendar mechanism patented instant windows, wrapped in this new version from the warm shade of pink. Read more on this complicated timepiece and shoot instant of its perpetual calendar (drawings included), I suggest you read the long post “Patek Philippe: a lesson in perpetual calendar “which I wrote in October 2010 thanks to the detailed material given me by Maison. Caliber R TO 27 PS QI. Features: Alarm on two stamps driven by a slider built into the case middle. small seconds. day, date, month, leap to annno window. Case: Not waterproof pink gold protected from moisture and dust. 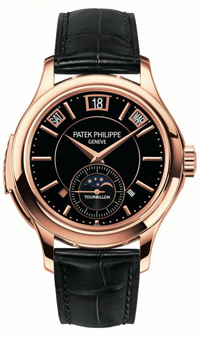 Browse through the articles Patek Philippe to read other news and information on the label.